Photos courtesy of Simon Lunn. 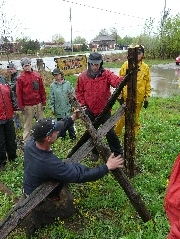 REAL offered a number of heritage cedar rail fence workshops led by Scott Dopson. Three workshops in 2011 and another in 2013 resulted in an attractive enclosure around REAL’s Community Garden, and demonstrated three different fence styles. 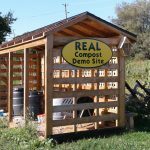 In the fall of 2013 one final workshop took place, which took down and reconstructed the fence on the William Street side to accommodate a Compost Demonstration Site. The compost shelter was established in 2018.